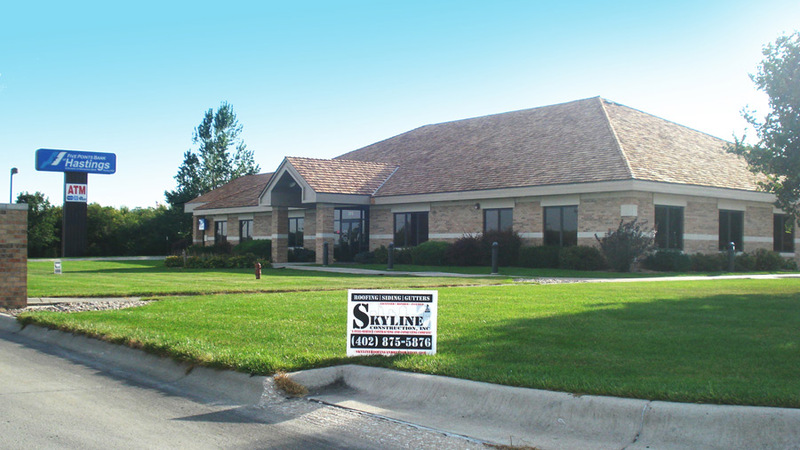 With over 70 years of combined experience, Skyline Construction, Inc. understands the storm damage insurance claim process as well as the needed attention to detail for your construction needs in order to give you the highest quality roof, a great construction experience and the best manufacturer warranty. Skyline Roofing of Nebraska and Des Moines Iowa are veteran contractors for residential, commercial and industial roofing systems. We offer complete flat roof replacement systems or restoration due to hail and storm damage. Skyline employs a team of storm damage estimators with a roofing industry and/or insurance adjusting background guaranteeing you with the needed experience and expertise to correctly value your project and completing it with the highest quality workmanship. Our goal is to have you as a future reference, so you can trust Skyline with all your roofing needs, from hail and storm damage roof repair, emergency and disaster restoration, maintenance, insurance claim management, or fixing a leaky roof. HOME OWNER INSPECTION - Some of the things to inspect and to look for are dents in gutter, bent fins on the air conditioner, dented roof vents and pipe caps, dents in window wraps and fascia, damaged lawn furniture and flower pots. Roof damage is about the only thing that can't be assessed from the ground, just because the damage isn't visible does not mean it isn't there, and extensive. INSURANCE ADJUSTMENT - The duty of an insurance adjuster is to give you an accurate accounting of everything damaged by the storm and a written estimate of what it will cost to put your property back to the condition it was in prior to the storm. Remember, this is only an estimate and actual costs may vary. This is easily resolved between the adjuster and the contractor. If you feel more comfortable have a contractor there when the adjuster comes, Contact us today! Chances are the whole process can be simplified and repairs can begin sooner. CONTRACTOR ASSESSMENT - A Skyline estimator will begin by going through a full property inspection. After completing our inspection, the estimator will review and answer any questions you may have on your statement of loss and then compare it with our inspection. Sharing the information on the statement of loss with our estimators insures you are getting a fair settlement from the insurance company, and they are allowing you money to cover everything needing to be repaired from the storm damage. Our inspection allows us to compare and double check to insure nothing was missed or overlooked. Remember your adjuster may have been inexperienced and might have missed something on the statement making your settlement lower than it should be! SETTLING THE CLAIM - It is important to understand, sometimes the adjusters scope of work will differ from ours, but there is a pricing standard that has already been set. Skyline uses the same software and price schedules as every major insurance company in the US. This software, called Xactimate, allows for several different combinations of line item entries which often make up varying estimates. Skyline works with the insurance company and its' adjuster to help determine the correct value for your project. We understand our prices may differ from the scope provided by your adjuster. Upon the signing of a Contingent Agreement, we resolve any pricing or scope difference with the insurance adjuster before beginning any work, insuring you, there will be no added cost other than your deductible. PERFORMING THE WORK - We understand all the concern of hiring a storm restoration company that is new to the area. In any community where we are providing a service, we have a representative available at all times to manage, inspect and honor our workmanship and its' warranties. We are confident in the quality of our work, and provide a 24-month warranty on all services. If a problem arises, our local representative will respond within 48 hours, and repairs will be made as soon as possible. Everyone associated with Skyline Construction, Inc. knows that this company is based on service, and that our aim is to provide the best service to every customer, every time. Need to file your property claim? If you don't see your company below, please contact us today. Don't see your roofing question answered above? Contact us to speak with one of our roofing specialists. Until it becomes damaged or leaky, most people don't think much about their roof. However, when that catastrophe strikes or that repair is needed, there are a whole bunch of questions that pop up.